By now with Stephen King, it's easy to think this is all kind of ridiculous. An invisible dome descending upon a small town in Maine? People trapped inside, trying to figure out what on Earth is going on and — as always in a Stephen King story — dying in droves? Good Lord. Is the King of Really Heavy Books — the author who is a one-man argument for the hernia-preventing benefits of e-books — running out of viable plot devices? This is, after all, the guy who wrote entire volumes about cell phones turning fellow citizens into ravenous zombies, about possessed and murderous 1958 Plymouths and about evil, immortal clowns who live in the sewers and prey upon children. Really, now. How much gimmickry can one writer expect us to stomach? Those statements are all completely fair and true. Trouble is, when it comes to "Under the Dome," they're also all entirely inaccurate. 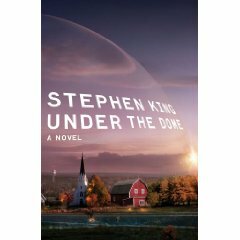 Because "Under the Dome" is one of those works of fiction that manages to be both pulp and high art, that successfully — and very improbably — captures the national zeitgeist at this particularly strange and breathless period in American history. The town of Chester's Mill, Maine — just up the road from the equally fictional Castle Rock, home to so many of King's unsettling yarns — is minding its own business one dazzling October day when an unseen force field descends upon it, slicing in two pretty much anything that was crossing the edge of town at that moment. What happens in ensuing days is even more unsettling. Except for Internet service and spotty cell-phone signals, the town is isolated and imprisoned in plain sight. And inside the dome, society slowly, inexorably, almost methodically begins to fall apart. King is usually classified as a horror writer, but he is more of a chameleon than that. He's capable of shifting from genre to genre at will, particularly in his short stories. "Under the Dome," however, is such a hodgepodge of genres that it ends up transcending genre entirely, and in the best of ways. The most accurate way of characterizing it in a single line may be "Our Town" meets "Silent Spring" meets "Lord of the Flies." For it begins becoming evident, in the usual serpentine King way, that the environment and the way we treat it have everything to do with why the dome is there and what it might mean. Coupled, of course, with some seriously non-rational things that are going on. The chief protagonist, Dale Barbara, is a just-retired Army man who fought in Iraq and did some things he isn't entirely proud of. He has repaired to Chester's Mill as a fry cook, trying to lay low. But in the days before "Dome Day," he runs afoul of some of the local cretins and becomes persona non grata through no fault of his own. In fact, he is trying to leave town when the dome falls and narrowly escapes becoming one of its first victims. Barbara becomes one of the focal points in the us-vs.-them panic that overtakes Chester's Mill like a slow-motion tidal wave, pushed along by the other focal point — "Big Jim" Rennie, the town boss, who is about as prosaically malevolent a character that King has ever devised and who has a no-good son to match. What pushes "Under the Dome" forward is not so much its whodunit or whatdunit plot, though that is tighter and more well-structured than usual for a King novel, even at more than 1,000 pages. It's how the characters treat each other and react to each other as they are forced together in their Biosphere-from-hell scenario. And why not? Chester's Mill in late 2009 is a microcosm of America at the same time, with all the angst and post-9/11 fear and suspicion of fellow citizens that pervades the entire republic. Add to that the notion of an entire society being watched and watching itself through a translucent bubble — a reality-TV metaphor if there ever was one — and you have novel as cultural document. The end, and the resolution, are less important than the path taken to get there. As usual with King, it's all seen through a fun-house mirror. And though the requisite supernatural elements are there, the really troubling thing — as with so much in society today — is that the fun-house distortions of popular fiction are, to everyday America, more recognizable than ever. The main reflection isn't that of Frankenstein or Dracula or the Joker or the Incredible Hulk. Instead, it looks a lot more like us. That's how Stephen King, at his best, has always been. What's really scary is that the world has caught up. Did you know you can create short urls with Shortest and make cash from every visit to your short urls.